Getting whiter teeth is the number one requested cosmetic dentistry procedure. While many people buy the “chemist brand” of over the counter whitener, our Practice whitening procedure produces better results, and in only a fraction of the time. Want to know more? Call Spencer Family Dental and we’ll gladly provide you with the pros and cons of the different types of whitening procedures. When it comes to teeth whitening (bleaching), it’s always best to begin in our office. We can advise you on whether you are a good candidate for teeth whitening. Those people with yellowish teeth typically have better results than those with brownish or grayish hues. Also, whiteners have no effect on tooth-colored composite fillings or teeth that are bonded, so whitening will only make these teeth stand out from the ones that do whiten. Are In-Dentist Procedures Better than At-Home Procedures? The whitening procedure that we do at Spencer Family Dental generally takes about an hour and the results are almost immediate. After ensuring that the gums are protected, a bleaching agent is applied to the teeth and it does all the work! Over-the-counter bleaching kits also contain similar ingredients to the ones we use in the practice, but you won’t get the custom-fitted mouthpiece, and your saliva tends to weaken the effectiveness of the gel. Some people experience tooth sensitivity after using bleaching agents. This is usually temporary and goes away after completion of the whitening process. Others notice irritation of their gums – especially when the bleaching tray is not custom made and the gums come in contact with the bleaching agent. Side effects should always be brought to our attention so we can advise you on whether they are typical or not. Can I Go Overboard on Bleaching? 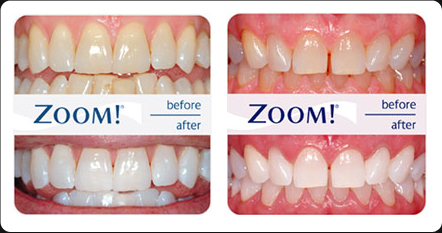 Believe it or not, bleaching can become addictive for some people who never believe that their teeth are white enough! This is dangerous because too much exposure to carbamide peroxide may cause the tooth enamel to appear translucent and increase teeth and gum sensitivity and irritation. Want to be really safe? Schedule an appointment with Spencer Family Dental and let us make your smile shine! Get in touch today.